Vibrant tones of yellow, orange, and red move in waves across the screen. Although the display looks like psychedelic art, it’s actually providing highly technical medical information – the electrical activity of a beating heart stained with voltage-sensitive dyes to test for injury or disease. 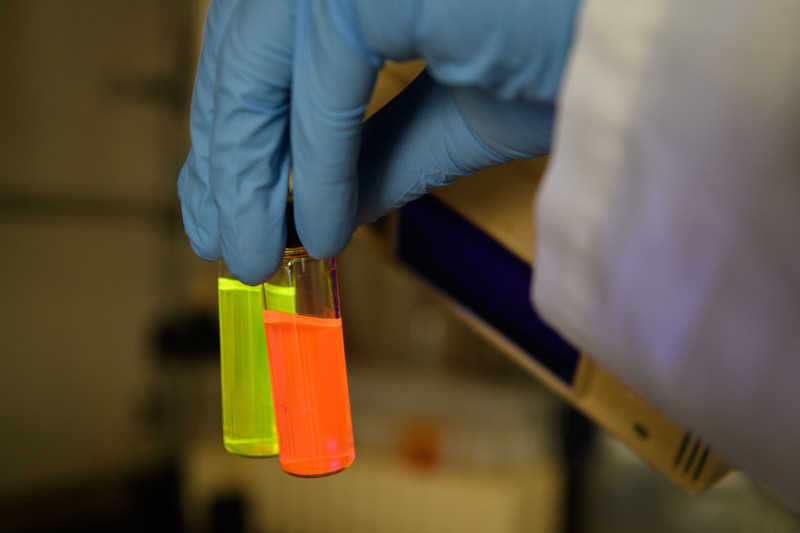 These voltage-sensitive dyes were developed and patented by UConn Health researchers, who have now embarked on commercializing their product for industry as well as academic use. Electrical signals or voltages are fundamental in the natural function of brain and heart tissue, and disrupted electrical signaling can be a cause or consequence of injury or disease. Directly measuring electrical activity of the membranes with electrodes isn’t possible for drug screening or diagnostic imaging because of their tiny size. In order to make the electrical potential visible, researchers use fluorescent voltage sensors, also known as voltage-sensitive dyes or VSDs, that make cells, tissues, or whole organs light up and allows them to be measured with microscopes. Not all dyes respond to voltage changes in the same way, and there is a common trade-off between their sensitivity and speed. Slower dyes can be used for drug screening with high sensitivity, but they can’t measure the characteristics of rapid action potentials in some tissues, like cardiac cells. Fast dyes can be used to image action potentials, but they require expensive, customized instrumentation, and are not sensitive enough for crystal clear results on individual cells. Professor of cell biology and director of UConn’s Center for Cell Analysis & Modeling, Leslie Loew and his team have developed new fast dyes that are also highly sensitive, eliminating the speed/sensitivity trade-off. Loew and research associates Corey Acker and Ping Yan have devoted much of their careers to developing and characterizing fluorescent probes of membrane potential like voltage-sensitive dyes. The team has even been providing their patented fast dyes to fellow researchers for the past 30 years, but they only recently became interested in commercializing their work. To learn more about the science of entrepreneurship, they took advantage of several of UConn’s homegrown programs. Loew and Acker’s first step into entrepreneurship began in the fall of 2016, when they were accepted into UConn’s National Science Foundation (NSF) I-Corps site, Accelerate UConn. They credit the program with giving them a solid foundation to evaluate their technology and business strategy. Launched in 2015, Accelerate UConn aims to successfully advance more university technologies along the commercialization continuum. 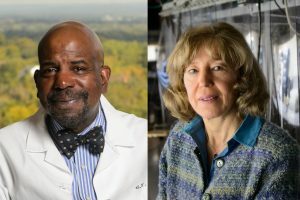 Under the auspices of the Office of the Vice President for Research and the Connecticut Center for Entrepreneurship and Innovation (CCEI), Accelerate UConn provides participants with small seed grants and comprehensive entrepreneurial training. Acker says the program also helped them identify an exciting new market opportunity targeting pharmaceutical companies. These companies need dyes that are both fast and sensitive for high-throughput screening of potential therapeutic targets. In high-throughput drug screening, scientists create special cell lines, and then use advanced equipment to robotically apply different drugs to rotating dishes of cells. The cells are stained with a voltage-sensitive dye that displays any change in membrane potential or voltage after drug application with changes in fluorescence. Acker estimates that pharmaceutical companies and contract research organizations (CROs) spend over $10,000 on these dyes for each week-long study. The dyes that Loew, Acker, and Yan develop will also allow drug companies to respond to new cardiac safety screening regulations from the Food and Drug Administration called CiPA (the Comprehensive in vitro Proarrhythmia Assay). CiPA regulations aim to establish better ways to detect side effects of new drugs that could cause a cardiac arrhythmia. In a key component of CiPA, screening is completed in cardiac cells with a realistic electrical heartbeat. The Loew team’s fast-sensitive dyes could offer drug companies more effective options than are currently available. Since CiPA applies to any new therapies from weight-loss drugs to allergy medications, Loew and Acker anticipate high demand for their technology. By following one of Accelerate UConn’s most important tenets to “get out of the building,” Acker conducted dozens of interviews with experts from industry who use VSDs for drug screening. They all expressed a need for dyes with improved sensitivity, faster speed, and fewer unwanted interactions or toxicity with the cells being tested. Loew and his team were confident they could deliver. Loew, Acker, and Yan’s new dyes improve on the current sensors used for drug screening, which involve a two-component system and energy transfer between the components. The researchers produce dyes that use a novel VSD system where energy transfer is more efficient, resulting in faster, more sensitive, and less toxic dyes. Loew says that support from UConn’s entrepreneurship programs was pivotal in transforming their initial discovery from project to product. “We learned so much from these programs, and we’re still reaping the benefits,” says Loew. 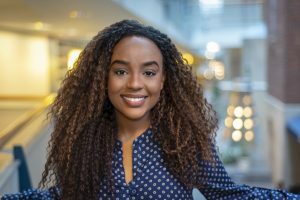 “Targeting the right customer helped us gain additional research funding through UConn’s SPARK Technology Commercialization Fund, and encouraged us to form a startup, Potentiometric Probes, to advance our product towards the market. The team is currently developing a new website that will be a resource for researchers using these voltage imaging techniques. Once launched it will be accessible at www.potentiometricprobes.com. 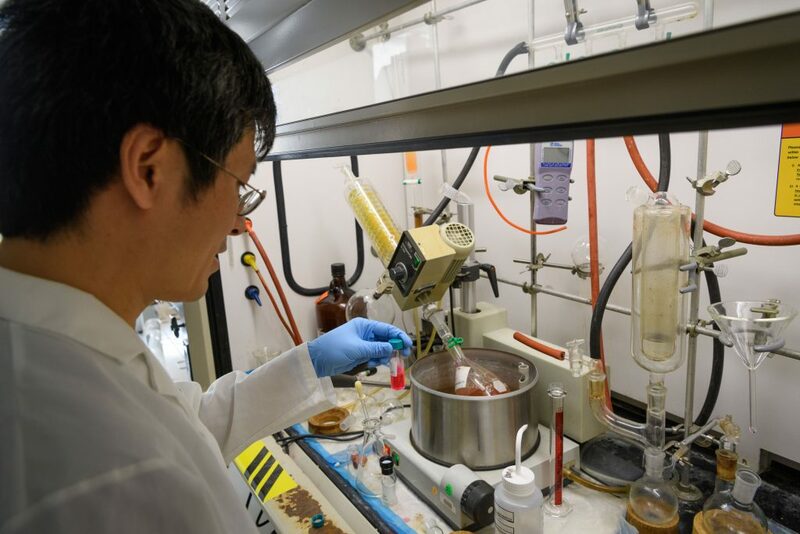 Through their UConn SPARK Technology Commercialization funding, the team has been able to develop and test two new dyes, and they have conceptualized a few additional possibilities. One of their current prototypes is extremely promising, Loew says. 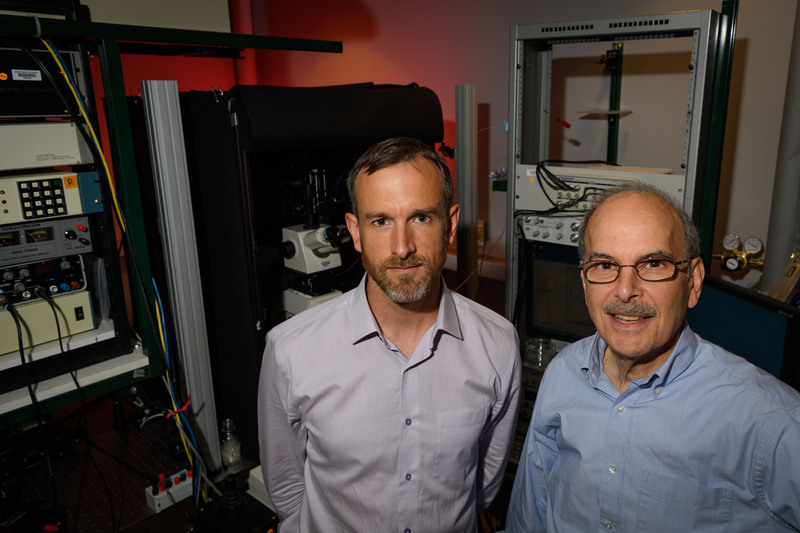 Loew and Acker are continuing to optimize their dyes and pursue follow-on funding to commercialize their products through the NSF’s Small Business Innovation Research (SBIR) program and BiopipelineCT, which is administered by Connecticut Innovations. They have also continued to grow as entrepreneurs by participating in the CCEI Summer Fellowship. Potentiometric Probes was named a finalist in this program, and will compete for an additional $15,000 prize in the Wolff New Venture Competition, also administered by CCEI. The team members hope that one day their dyes will have a major impact for both the pharmaceutical industry and fellow university researchers. The deadline to apply for the UConn SPARK Technology Commercialization Fund is Sept. 1. Click for more information and to apply. The deadline to apply for the fall 2017 cohort of Accelerate UConn is Sept. 22. Click for more information and to apply. Loew previously conducted research through an award from the National Institutes of Health (R01 EB001963-32), which was in continuous operation for more than 30 years and provided all prior funding for the development of voltage-sensitive dyes. 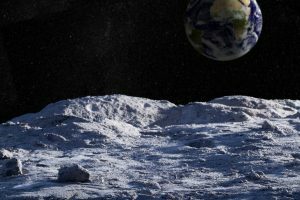 However, no resources from this previous award were used to fund product development or testing of the current technology.